Shortly after 10 a.m. near the beauty salon. The victim made it a block before going into the smoke shop on Blue Hill Avenue near Glenway and Old streets. The homicide unit was called in due to the severity of the victim's injuries. Society taped off. Photo by KMV. WCVB reports four people were stabbed at Society on High, 99 High St., shortly after 1 a.m. Read more. Boston Police report arresting an 18-year-old on charges he's held up at least three restaurant food deliverers at knifepoint, most recently early this morning around the corner from his Wildwood Street home. Read more. UPDATE: Bail set at $1,000 and Cornejo's next court date is April 5, per the Suffolk County DA's office. Boston Police report arresting Lynn man for a knifepoint robbery in the lobby of 434 Border St. yesterday morning. Read more. Shortly after 9 p.m. on Blue Hill Avenue between Woodbine and Clifford streets. The homicide unit was called in due to the severity of the victim's injuries. 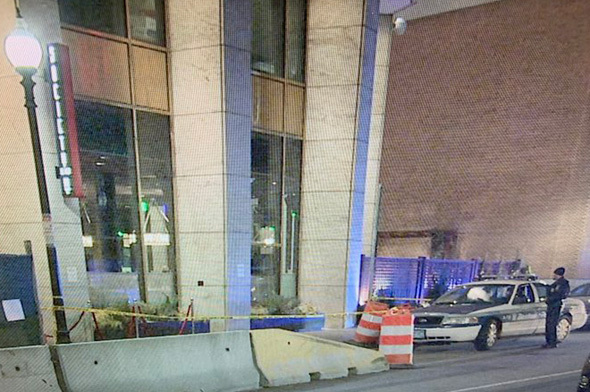 WCVB reports a man was stabbed outside Taverna Medallo, 411 Chelsea St., around 2 a.m. The homicide unit was called in due to the severity of his injuries. Boston Police report a person was stabbed at 148 Stanwood St. around 11 a.m. on Tuesday. Read more. Boston Police report arresting Adelson Lovensky, 21, on charges he stabbed a man on Tremont Street near Park Street around 10:45 p.m. on Jan. 24. Read more. Victim identified as Edward Mowring, 70. Boston Police report a man was stabbed shortly before 10 p.m. at 49 Blue Hill Ave. He was declared dead at the scene. He is Boston's third murder victim in 2019. One of the suspects. Surveillance photos via BPD. Boston Police report arresting a Lynn man for a New Year's Eve robbery and stabbing in the Public Garden. Read more. A man was stabbed in the leg during a robbery on Bowdoin Street near Adams Street around 10 a.m. and made his way to a local hospital, where he is expected to recover. Boston Police report a man was punched and then stabbed outside 760 Cummins Highway, at Favre Street, around 12:25 a.m. Read more. The knife Gonzalez plunged into Martinez, recovered from the water off Constitution Beach. A judge today sentenced MS-13 member Edwin "Sangriento" Gonzalez to life in federal prison for helping to butcher one teen on Constitution Beach in 2015 and a second teen five months later on Falcon Street because he thought they were members of a rival gang, the US Attorney's office reports. In the stomach, shortly before 10 p.m. on River Street between West and Arlington streets, Doogs reports. Detectives look for evidence at stabbing scene. Photo by KMV. KMV reports a man was stabbed on the 800 block of Cummins Highway early this morning. Cambridge Police report a man was arrested yesterday for threatening somebody with a Japanese saw - a tool normally only used by woodworkers. Read more.